No breezy manner here. Concise communication is the goal. This book is still the best of the style guides. First published in 1920, it lays out examples of correct and incorrect usage, and guides on the effects of sentence construction. It is a short book; no word is wasted. In terms of grammar and punctuation, this is a great revisit to what we learned at school. The book also offers advice on style, which I certainly never gained from my school teachers. So the writer may choose to write in short or long sentences, active or passive voice. 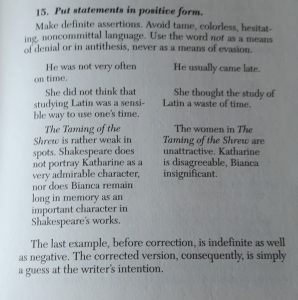 Avoid statements in negative form. Positive statements strengthen writing. I love some of their specifics, especially on adverbs. “Do not write tangledly. … Nobody says tangledly.” Or one of my personal bugbears in web writing, even though I am guilty of it myself: “Do not affect a breezy manner.” The list of misused words and expressions highlights and corrects many errors seen today, especially online. Should you write ‘alternate’ or ‘alternative’? Strunk and White know. Some of the constructions would apply mainly in formal writing today, such as academic essays, or serious newspaper articles. Readers are accustomed to a casual writing style, and strictly correct formal writing has class associations which can be a barrier to communication. Even the BBC uses ‘less’ and ‘fewer’ interchangeably these days, and the singular ‘their’ rather than the grammatically correct ‘he or she’ has become commonplace. Writing is a political act, and so these usages carry meaning about the writer’s position in society, and even issues such as their position on binary gender labelling. That said, a writer must know and understand correct usage before deciding whether to adopt it for a novel, blog or academic article. “Nadim wanted less peas” is no more correct today than it has ever been, but it is up to the writer to decide whether ‘fewer’ adds to understanding. Well – I say it’s up to the writer, however an editor will still pick up these points. I found this book a quick read full of valuable guidance, and it has a permanent place on my shelf. Amazon reviews suggest the print version is the one to go for, as the Kindle edition appears to have formatting issues. 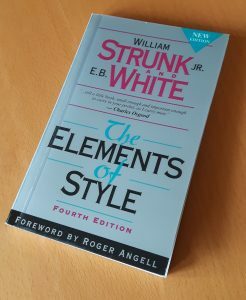 I must add that it is really, really hard to write a review of Strunk and White without becoming self-conscious. I feel as if they are looking over my shoulder. And given their 94 years of experience, that’s no bad thing.